On the occasion of my son’s birthday this weekend, I put together my first care packages of the school year. I’m generally terrible at this type of thoughtfulness but figured I’d also send something to his sister since I was already going to the post office with one box. It is also good luck that I have somebody living in my house who still has the energy for things like baking, and she made the following treats for her siblings. I coexisted for about 24 hours with those things, screaming my name from their cooling racks, and only succumbed to eating one of them. But, oh, it was good. Think outside the box (LOL, get it?) and bring them along to any gathering and you’re guaranteed to be the most popular girl there. Or dude. There are some dudes out there reading this. You just whip up some peanut butter cookie mix, plop in mini muffin tins and squish a peanut butter cop on top (or kisses if you, like some of us, run out). Coat miniature muffin tins with non-stick cooking spray. Follow directions on back of cookie mix pouch. Place about a spoon-sized ball into each section of muffin tin and bake in a preheated 350°F oven for 7-10 minutes or until puffy. Remove from oven and place one unwrapped peanut butter cup on each partially baked cookie. Let cookies cool in tins for 5 minutes (much easier to remove once they’ve hardened a bit) then remove from tins and cool completely on baking rack. Got any cute care package ideas or recipes for goodies that travel well? Share in the comments below. This entry was posted in t is for teenagers and tagged care package, college kids, cookies, humor. Bookmark the permalink. Hi Amy. I make these every Christmas and they get gobbled before I can set them down. 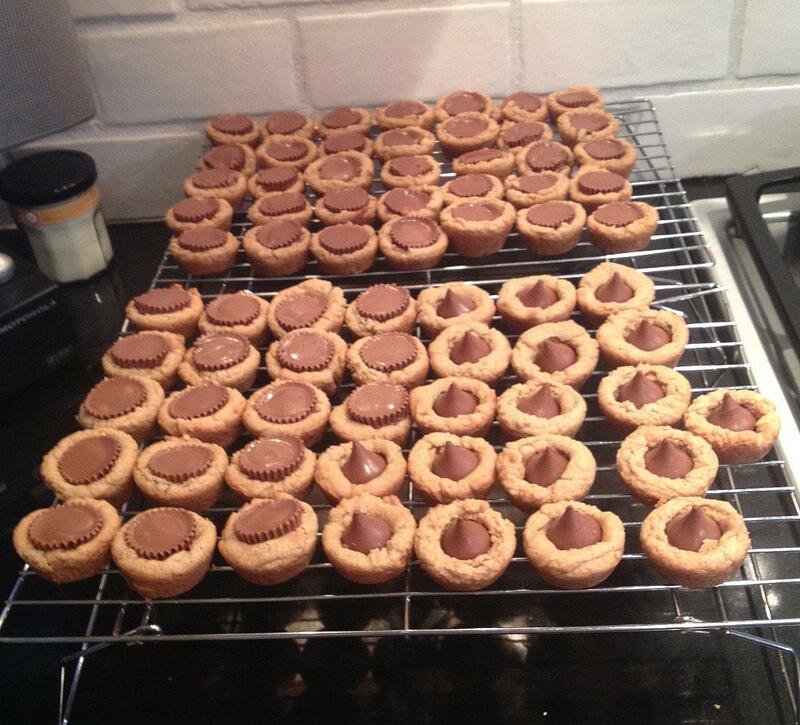 Tip: Freeze the peanut butter cups and they are easier to push into the cookie. I have always just pushed the candy into the cookie right when they come out of the oven and are soft. No need to put back in. They are GOOD STUFF! When I lose 10 lbs I am totally making a batch and eating them all. Therin lies the source of my yo-yo weight issues.